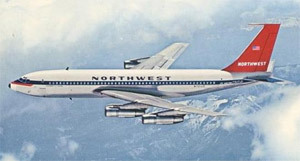 Northwest Airlines Flight 705 was a regularly scheduled passenger flight from Miami to Portland, Oregon, with intermediate stops at Chicago, Illinois and Spokane and Seattle, Washington. The flight departed Miami International Airport into areas of anticipated turbulence associated with thunderstorm activity. The departure strategy required maneuvering away from the identified thunderstorms immediately after takeoff, in order to climb above the thunderstorms and subsequently fly over them. During the planned maneuvering, approximately 13 minutes after takeoff, and while climbing through 17500 feet, the flight encountered a strong updraft, resulting in a high nose up pitch attitude and vertical speed of approximately 9000 feet per minute, and an associated decrease in airspeed from 270 knots to 215 knots. Investigators believed that the pilot responded by applying full nose down elevator and full nose down stabilizer trim to prevent further airspeed loss. Following these control inputs, the airplane entered a steep dive, and accelerated to beyond 470 knots. In spite of recovery attempts by the pilot, the airplane was not able to be recovered from the dive, and broke up in flight below 10,000 feet. The Civil Aeronautics Board determined that the probable cause of the accident was the unfavorable interaction of severe turbulence and large longitudinal control displacements resulting in a longitudinal upset from which a successful recovery was not made. As the investigation of Northwest Flight 705 proceeded, other jet transports became involved in similar upsets. These pitch upset events were collectively referred to as "Jet Upsets." This terminology was used because the phenomena appeared to be unique to the new generation of swept wing jet transports which began to enter service a few years earlier. The investigation of Northwest Flight 705, and associated similar pitch upset incidents, led to changes in operating procedures and design requirements for jet transports, as well as improved forecasting and dissemination of hazardous weather information to Air Traffic Control and Flight Crews. These actions proved effective in substantially reducing the occurrence of this type of pitch upset events.